The Zipp Tangente Road Tube is designed to improve rotational stability by decreasing rotational mass at the valve body. This is accomplished thanks to a lightweight aluminum Presta valve stem which is only available in a 37mm length, but it features a removable core for easy use with Zipp's inline extenders. Zipp also uses 0.60 mm butyl thickness for the tube itself, offering increased durability and reliability over other super light designs. 700c x 20 - 28 mm. Claimed weight is 72 g.
The reason I started using Zipp tubes is the stem length is a short 37mm and the stems are black, plus with Zipp valve extenders the length is perfect for deep Zipp wheels and perfect for my super 9 disc also. Now moving past looks they are very good tubes, super low flat ratio, hold air very good and come in a small tight wrap for spare packing. A 4 on value because they are a bit spendy and never on sale so that look fit issue has to have some value or Conti or Vittoria tubes may be an equal or better choice..
Been riding these tubes with a 303 NSW. A few punctures, but never a pinch flat. This is a very light tube and has great looking black valve stems which work well with Zipp extenders. I use this tube for racing and training rides. Its light weight and compact rolled-up size make it easy to carry a spare. I bought a new set of wheels and thought I would try some lighter tubes...the tubes work ok one just had a slow leak and I could not find anything in the tire that caused the puncture...what I do not like is when I used them with the Zipp valve extender the wrench supplied (wrench is too big and dose not fit snuggly on valve) stripped the valve I could only get one to work out of 3 so feel it was a waste of money...I will go back to using a tube with a longer valve. As I usually ride Zipp 808s, the removable valve core in these tubes work perfectly with the Zipp Valve Extension System I use with them. Easy to put the valve extenders on with some teflon tape and I never have an issue with leakage from the valve. Great tube for a great price. Highly recommend it. I really like these tubes and as far as a tube goes it is durable light and fits my budget. The stand out for me is the valves stem and the Zipper logo. It looks much better than most every other valve stem. Ya big deal except it's the only visible part of the tube. zipper also make different length valve extenders and with the removable valve core it it's a snap getting these set up for a deep profile wheel. Other than latex these are my tube of choice. If you are investing $1000 in Zipp rims no question you should update tubes to run in them. Very smooth rolling and no flat issues to date. Will purchase again. When You have a set of Clinchers for shallow ZIPP-101's to Deep ENVE 7.8 Smart Wheel Sets. They Work Flawlessly ! Just make sure you don't loose a ZIP Wrench -( . Excellence in the making of this product! Tasted it and filled it with Slime, no punctures in months. I bought these oddly enough to use in my Hed3 wheels as they need a short stem. I love them. Best removable core on the market. Maybe it's just because they say Zipp on the side, but they seem better and easier to work with while mounting. Knock on wood, no flats when combined with Stan's noTubes sealant. Used these tubes (with valve extenders and Vittoria 23c tires) on several training rides... seemed to work great. 90 miles into a race the front flatted. I replaced the tube with another Zipp, inflated, and the tube immediately blew before I even got the wheel back on the bike. I inspected both tubes and attempted to patch them. The tube seam had split in the exact same location on both tubes and the resulting rip was too big to hold the patch. It wasn't in contact with the rim and no problem with the tire, so I can't figure it was anything but a simple blow-out under pretty low pressure (100psi). Thankfully another racer dropped me a tube (non-Zipp) I was able to install and finish out the race. Not sure if it was a bad batch or a general product problem, but I won't be trusting Zipp tubes from now on! I use this with Vittoria EVO Open Corsa CX 25mm tires. The tube is rated for 18-25mm, has a removable stem core with 37 MM stem length. Weight is resonable and the tube seems durable. Tubes themselves seem fine. Light, nice-looking and seem well-made. 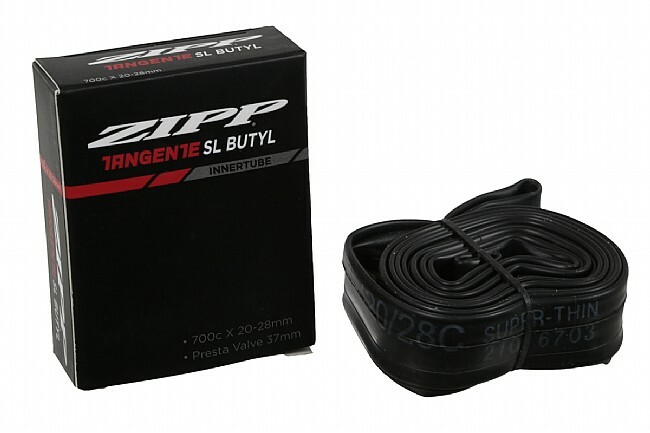 My gripe is I have Zipp 404's and figured this tube along with the Zipp valve extenders made specifically for my wheel (which is 58mm) should be perfect. Nope. Too short. Hard to get a pump head on reliably. Good tube as far as that goes. I like the valve stem, goes well with my shiney Ksyrium Elite wheelset. The valve tends to twist out when filling with air, a little annoying but no big deal. Not the lightest but not bad. Good quality butyl and a short valve stem. Great for shallow rims. Perfect with my 700x25 tires on HED Ardenne 'hoops'! Very light weight quality tubes. I bought several and they all ranged in 71-74 grams. They cover a nice range of tire width from 20-28, which makes them ideal for middle 25mm tires (the most common) The Presta stem is a bit short. It is best suited to be used with the valve extender. I wished they would make them with longer valve stem as well. Understanding bicycle tube valve types, materials, and sizing.